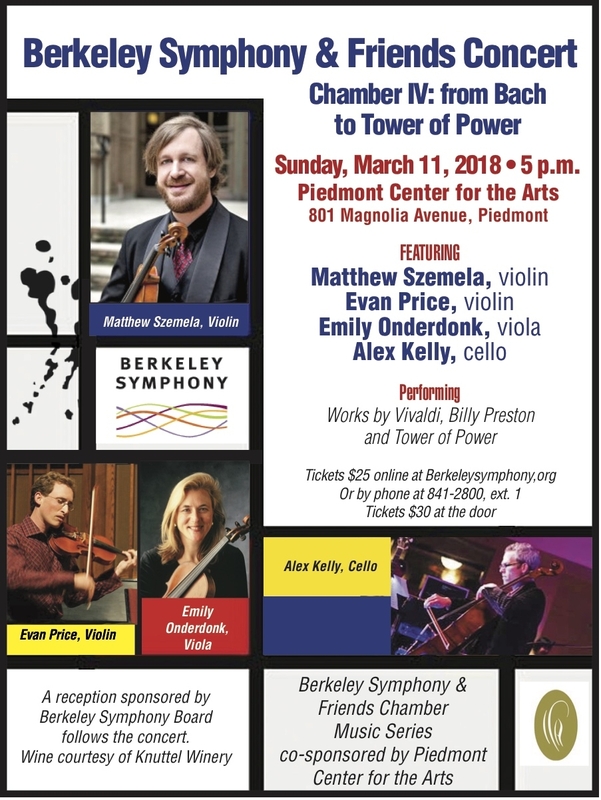 In its fifth season of concerts in Piedmont, Berkeley Symphony & Friends presents a crossover program with the spectacular Bay Area group Vitamin Em, featuring Matthew Szemela, violin; Evan Price, violin; Emily Onderdonk, viola; and Alex Kelly, cello. The program includes works by Vivaldi, Billy Preston and Tower of Power. Presenting an eclectic mix of string music from diverse eras and genres, from Baroque violin masterworks of Bach and Vivaldi, through the Classical era with one of Mozart’s earliest string quartets, closing with the vivacious rhythms of funk, R&B, folk, and jazz. “Phoenix” and “Haase A’s” give a taste of the fiddle musics of Norway and Sweden, respectively, while “Don’t Change Horses (In The Middle Of A Stream)” takes us back to the Bay, courtesy of Oakland funk superstars Tower of Power.